Disclosure: This stay at Lake Buena Vista Resort Village & Spa was hosted but all thoughts and opinions are my own. This past week, before headed on my first Disney Cruise vacation, I spent two days at Walt Disney World Resort. I was travelling with my husband and friends, so was seeking someplace that was near Walt Disney World, but also vey spacious with lots of amenitites to make this the vacation we’ve been dreaming of for so long! We found the perfect hotel for our 2-night stay at Lake Buena Vista Resort Village & Spa! To put it simply, we were living the suite life at this hotel – our room had a living room, full kitchen, two bathrooms (including a jet tub in one of them), and two bedrooms; balcony overlooking a pirate pool…with the total room size being 1080 square feet! My husband and I enjoyed the master sweet with a spacious and luxurious bathroom and bathtub, and our friends enjoyed a room with two full-sized beds. Each aspect of the hotel impressed us, with the kitchen having all the appliances and supplies you could want (even kitchen items for baking). This would be perfect for a long stay with family, since you could conveniently cook in this granite-counter topped fully-equipped kitchen. I am normally someone who has a hard time sleeping in a hotel bed, but the beds were very comfortable (just the right balance between soft and firm). 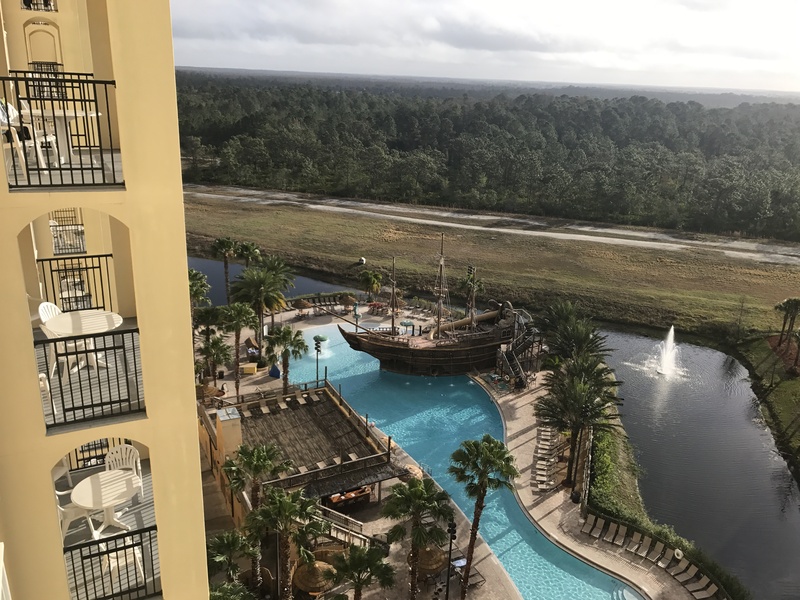 It was magical to get to wake up and go on our balcony on the 11th floor to see sunsets over lagoons and Lake Buena Vista Resort’s pirate pool. I can’t wait to someday return here to take a trip with my daughter, I know she would love to spend a day at the pool (along with poolside restaurant) all day! The hotel also had a nice fitness center that my husband and I used, which is in the hotel tower that also includes a convenience store, game room, and pub. Lake Buena Vista Resort Village and Spa also includes…a spa, of course! As someone who often travels with my family, I love that this resort has so much to offer, so if you want a relaxing day at your Orlando hotel you can eat a table service meal, head to the pool and fitness center, arcade, do shopping at the adjacent Lake Buena Vista Outlets, and then end with a massage and relaxing in your spacious room (you can also find one, three, and four bedroom rooms as well). Needless to say, we can’t wait to return someday for a future visit! And only being 5 miles from Magic Kingdom, you can’t go wrong! To learn more about Lake Buena Vista Resort Village & Spa, you can visit their site here, as well as find them on Instagram.